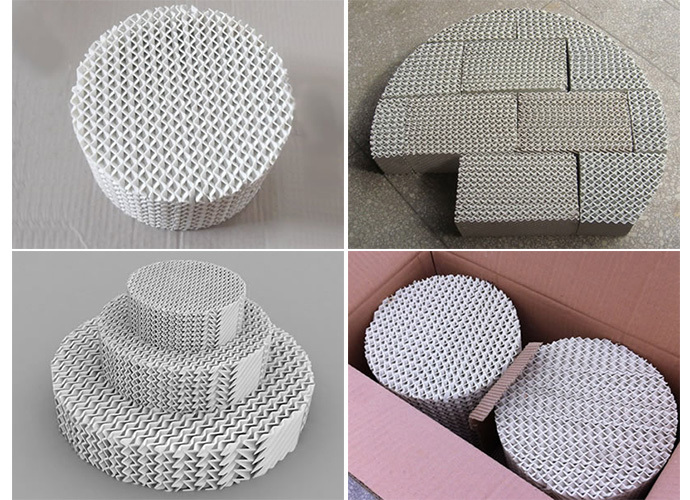 Ceramic structured packing has similar structure with grid structured packing, which is composed of several smooth surface corrugated sheets in 60° or 45°. The neighbor corrugated sheets are placed oppositely and then assembled into packs with geometric structure. Compared with metal structured packing, the ceramic structured packing has better corrosion and rust resistance performance and high temperature resistance performance than metal structured packing. Additional, ceramic structured packing has high separating efficiency, low pressure drop, increased operating elasticity and maximum liquid treatment. Commonly, the ceramic structured packing is made into round packs to suit the columns and other towers. It can be made into several separated modules for easy transporting and assembling for large diameter structured packings. · Corrosion and rust resistance. · Alkali and acid resistance. · Absorb nitric acid and concentrated sulfuric acid and purify the chemical air. · Used as catalyst carrier in heat exchanger.